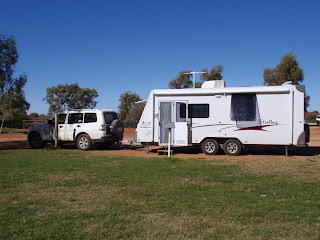 Left the caravan park bright and early at 8.30am, although we were one of the last to leave, then had to queue for nearly half an hour to fill our water tank at the Council depot. Very slow process that took all our 20 cent pieces. Waved goodbye to the lookout at The Big Winch and thought of the long, steep climb to the top only to find a car park and road coming up from the other side. The early morning light was just fantastic on the mullock heaps and their beautiful colours varying from white to deep ochre. A cool morning with clear skies, which continued all day – not a cloud to be seen and the temperature starting to increase now to about 20. Fairly windy on the road though. These days have been our worst for fuel consumption, averaging 21-22 litres per 100 kilometres – not good! 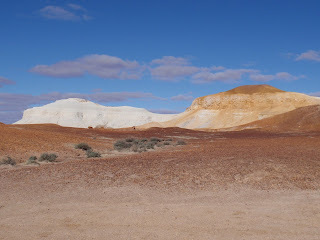 The terrain today changed from the bare, stony desert at Coober Pedy to desert with either low bushes or stunted scrub. We saw a large number of eagles today, a few sheep, three horses, some galahs, cockatoos and crows. Oh, and a dead kangaroo. Not much appears to live out here. We stopped for a short break at the Cadney Roadhouse, a popular spot for travellers, as well as truckies. Like good caravanners, we pulled into the line of parked caravans along the side of the clearing, joining about five or six in front of us, with another one behind. Just as we got back into the car to pull out, a HUGE road train (biggest I have seen!) pulled in and stopped beside the line of caravans. The driver then got out and disappeared, leaving everyone standing open-mouthed. The caravan behind us backed out, then we backed up (with me walking behind the caravan with the two-way) and the ones in front were still standing, staring, when we left. Our stop for the night is at the Marla Roadhouse – and what a lovely oasis in the middle of the desert. Apart from the service station, there is a small supermarket, a post office, takeaway, restaurant and hotel, of course. The caravan park is behind and actually has grass!!! We were first in, fortunately, as the instructions we received regarding parking were a little confusing. After deciding where we wanted to park as regards sun, it took Les four tries to get into position, driving across the grass each time. Thank goodness no one else was there to see us – it was absolutely appalling! After getting level, connecting the power, setting the jacks in place, etc., we started to wonder if we were actually supposed to be ON the grass. No – we were supposed to park on the road, BESIDE the grass! Another move off the grass before we set up again. There are a lot of flies here. Get use to the flies, they will become your constant companions in the Centre.